There is no doubt about it. Military children are strong, resilient, and adaptable. But it can be a very stressful lifestyle and when there are resources that can help transitions, PCSs or deployments just a little easier it is important to share them. Here are 10 of our favorite resources out there for your family. Military Family Support is what we are about! It was a simple project: put on the new grill flame covers purchased at a big box store. The old ones had rusted and worn out and these replacements would "take a sec to put on " and including time to wash and clean the grill … 15-20 minutes in a busy schedule. Sounded simple! After some contemplation on why it was wrapped so tight with such tough plastic, I realized that is was an industry standard product. I thought back to when a product like this could be picked up with a simple price tag on it. You carried it to the cash register, the cashier rang it up, buyer paid for it and took it home and installed it. What happened to change this process? Create a pillow case for your soldier, sailor, marine, airman or coastie. Iron on a picture of yourself and write cute sayings with a fabric marker! Military Discounts in your area - monthly email with local businesses that support the military-families. Easy to sign up. Hale Koa Hotel, an Armed Forces Recreation Center in Waikiki. Join us on Pinterest and share in the fun! Moist Rich Rum Cake Company is coming! Now there’s a reason to make dessert. A box yellow cake fancied up creates a cake rich in flavor and pretty as a picture! Back in the storage closet I have a Bundt pan that I save for special occasions… or just when I can THINK of some way to use it. This is perfection. He is what we would call a straight shooter! Maj. Gen. John A. Toolan, Jr., U.S. Marine Corps, met with the DoD Blogger Roundtable to discuss Afghanistan after returning from a year in command of U.S. Marines and allied forces in the Helmand and Nimroz provinces of Afghanistan. He provided a sobering but positive perspective of the situation next to the borders of Pakistan and Iran and the general was ready to share his thoughts on the current events in Afghanistan with the roundtable bloggers. Imagine a new cell phone network connecting villages, additional and improved roads laid down to make it possible for farmers and villagers to connect, the Kajaki dam controlled by the Afghan government and providing power and irrigation for the villagers, a security situation improved to the point that the Afghan government is seen as "the winning side" and you have described what the Marines, allies and Afghan security have done in the last year in two critical provinces! It was a visual I clearly saw as Captain James Morgan reminded us of the 2004 massive earthquake and tsunami and the tragic events and impact on the Indian Ocean countries (has it really been almost eight years?). The destruction and human misery was beyond our understanding. The plight of the survivors with no water, no food, raw sewage everywhere, clothes sometimes stripped off them and trying to find family members who had been separated was just heart rendering. The fantastic international response also reminded me of the Haitian earthquake and how the US military supported the effort to save lives and give the Haitian people hope! We blogged the story for our military families numerous times including an interview with Lt General Keen, the Task Force Commander. We have to remember, always, but it's never easy. When we think about soldiers, sailors, marines, coasties, airmen on Mother's Day we most often think about the mom sitting back at home hoping their Hero is safe and out of harm's way. Not often do we think about that Hero thinking of her own children who are back home and missing them to pieces. But it is true. Women comprise 200,888 or 14.3 percent of the DoD Active Duty force. (She Serves, too) I'm sure they could use a message of support this upcoming Mother's Day! 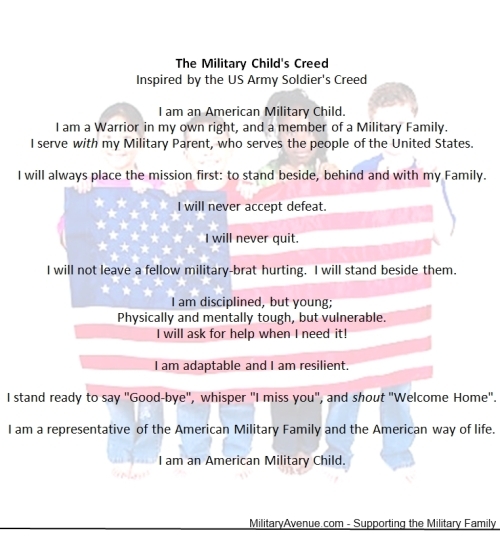 Month of the Military Child - How Do You Influence Your Military Child/Grandchild? I had a lesson taught by a small loving act during this Month of the Military Child. A package arrived in the mail from @MilAve_Leanne and when I opened it, I was humbled by what I saw. The art work was a future Monet or Picasso and the words were clearly a Robert Ludlum or Tom Clancy to be. A simple art project. Simple smiles. Simply fun! As my boys are getting older projects at school have grown more and more complex. In the process I have picked up a few art-project supplies kept tucked away for a rainy day. Popsicle sticks were needed for a diorama of Iceland. Pipe cleaners were needed for a science experiment involving borax. Markers are kept out of reach of a toddler. Glue, scissors and paper all quickly rounded up. All this is the the perfect making for a morning of fun. Great descriptions of our soldiers, sailors, marines, airmen, coasties and, yes, families. At this moment it also humbly describes us, our blog, 'Our Letters to You', a military family blog: honored, respected and we are very proud. We are honored! 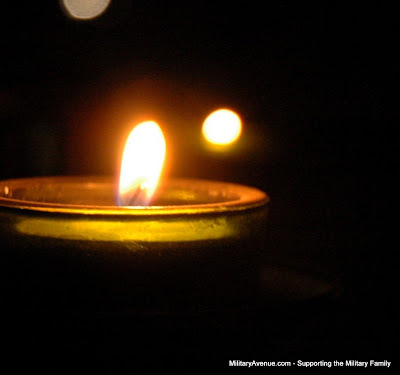 Our 'Military-Family Blog' has been nominated as one of the Top 10 Blogs for US Military Support by Military.com. That is what we are all about; supporting you, the military family. The wars in Afghanistan and Iraq have been tough on the men and women of our armed services! We have suffered casualties, multiple long deployments and families have sacrificed too with impacts on spouse employment, child care help from a spouse, missed /holidays/birthdays/anniversaries, etc. But often we forget about the equipment that is used to fight and protect our combatants. The desert environment has been particularly hard on all the services’ equipment and will need to be taken care in an austere budget time frame. From ground transportation vehicles, to helicopters, other aircraft, weapons and ground equipment like generators the toll has been heavy. Extended flying hours, on the road hours, weapon usage, run time on generators and more have left our equipment (that provides our fighting force an edge) with down time and repair needs. In some cases, equipment needs to be replaced completely. To do less America is to say, I do not support my service members’ safety but I want you on forefront without the right equipment. The DoD Blogger Roundtable met with Army Major General Tony Cucolo to discuss the equipment issues for all three Army components: Active, National Guard and Reserve. General Cucolo is the Director of Force Development and is responsible for updating and maintaining Army equipment. He brought his team to discuss the status of Army equipment and how the Army was responding to this need. The general made one thing clear: The Army staff at the Pentagon is involved and cares! They are combat veterans and have a “passion and desire to get things done right”. Some have children that are deployed now too! It was a routine medical appointment, with routine questions. My blood work looked good, my blood pressure was great. My weight... I had gained a few pounds over the winter but for me it's the typical winter gain that I'll lose with summer activity. I was a healthy 38 year old. This was a new doctor for me. She started asking family history and cancer was mentioned time and time again. Cancer is one of the leading causes of death in the United States but fortunately, many common types of cancer are treatable if detected early. The Month of the Military Child provides a great focus on a special group of Americans! One unique way to enjoy military kids: Good friends traveling across many miles to see each other. Military brats will always find a way to get together. MilitaryAvenue's Dan had very special guests: friends from high school and on into adult hood. Both guys were young when they met at Keflavik Naval Air Station, Iceland and when follow on PCS assignments for their parents brought them together again in Virginia, the friendship bonded. Now, both have wonderful children of their own which we held, hugged, laughed about and told stories before we digressed into military experiences. The guest, Matt had attended a service academy and then went into a career track that frequently put him into harm’s way. His spouse, also a family friend, had met him at the academy and went into a career track that made it hard for the two of them to be together, so Jana had joined the reserves after a lengthy active duty stint. They had a beautiful military child and you could see the pride in their eyes. They had traveled to Michigan to be part of a remembrance program for a fallen hero and took the opportunity to visit Dan's family and eat, talk and share. Today is a big day for an American hero. Captain Barry Crawford will be receiving the nation’s second highest award for combat valor - the Air Force Cross (each service has an equivalent). In front of friends, his special tactics team members, fellow military personnel and distinguished visitors, Captain Crawford will be recognized for his heroism on the battlefield in Afghanistan. His coolness under fire helped deliver ordnance from the skies to assist his special operations team and Afghan commandos and prevented them from being overrun! The Air Force special tactics officer is credited with saving many Afghan and US soldiers’ lives during that pitched 12 hour battle for control of an Afghan village, surrounding high elevations and denying the Taliban unchallenged access. He described the Afghan commandos that were the preponderance of the allied fighting force that day as “ferocious fighters”. What has been your proudest moment as the parent of a military child? We will draw a random winner from a military-family that comments with their proud moment. The winner will receive a $60 Character Basket from Nickelodeon Suites! Just a little Housekeeping:* Please leave your email address in your comment, or send and email to leanne@militaryavenue.com with your email address and which comment is yours so we can notify you if you are the winner. One entry per giveaway per email address. * We will randomly select one winner (using Random.org) from all our military-families that enter on Monday, April 16th at 10am EST. We must hear back from you by Thursday, April 19th. * You must be over the age of 18 to be eligible to win. Moms & Dads enter today so that we can send you a gift package to give to the military-child in your life! This giveaway is intended for military-families, please respect our desire to honor military-children during 'Month of the Military Child'. * If you also subscribe to our Military Family Newsletter (sign up here) you will be eligible for our Friday drawing of a $20 Gift Card to Wal*Mart from SitterCity. We will be having this drawing each Friday during the month of April. There is something about a holiday that is a bit rejuvenating. What do you do to prepare for Easter? There are many words I use to describe a cake: delicious, moist, sweet. However, if you ask any of my four military-brats they would probably tell you YUMMY! And seriously what better adjective is out there for food?! What word best describes your military child or children? Cool, Resilient, Sympathetic, Smoochable would be choices for my own. * Please leave your email address in your comment, or send and email to leanne@militaryavenue.com with your email address and which comment is yours so we can notify you if you are the winner. One entry per email address. * We will randomly select one winner (using Random.org) from all our military-families that enter on Thursday, April 12th at 10am EST. We must hear back from you by Monday, April 16th. * You must be over the age of 18 to be eligible to win. Moms, Dads, Aunts, Uncles, Grandpas and Grandmas enter today so that we can send you a cake to give to the military-child in your life! This giveaway is intended for military-families, please respect our desire to honor military-children during 'Month of the Military Child'. Don't forget this week we are asking: "You know you are a military brat when.." Answer here for our first giveaway and watch for more.